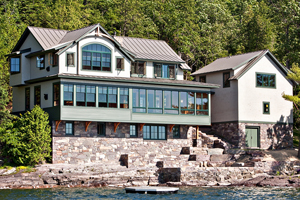 We had been looking for property on Lake Champlain for ten years. When we found the perfect property we called Brian Vorse to discuss the possibility of renovating the existing structure. Vorse Construction had built a house for us a few years ago, and we had such a great experience that we were looking forward to working with his company again. When the decision was ultimately made to demolish the building and construct a new one, Brian guided us through every step of the process. He brought in the architect and gave us feedback through the design phase. Our project involved extensive blasting, relocating utilities and trucking large amounts of material off site, and Brian took great care in working with the excavators to accomplish all this with minimal impact on the surroundings and without inconveniencing neighbors who shared our one-lane access road. Much of the actual house construction took place over the winter, and Brian and his crews worked diligently and efficiently to keep our project on track. Brian’s crew, as well as the subcontractors, are an exceptionally talented and knowledgeable group, and worked extremely well together. Communication was excellent across the board. Brian consistently kept us informed, gave us ample opportunity to evaluate even the smallest details, and checked in regularly before proceeding with each phase of the work to be sure that nothing slipped through the cracks. In addition to exceptional quality, a big reason that we wanted to work with Vorse Construction again was Brian’s honest and straightforward business model. With no mark-up on products and a set contracting fee that is clearly spelled out, it took the mystery out of the process for us and made everything very transparent. We were provided with all invoices for materials and subcontractors, and it was easy to track all expenditures. We found it to be a very comfortable and predictable process. As the work on our house progressed, we started to get excited about how nice the finished product could really be. When the work was complete, it surpassed our expectations. We couldn’t be happier with the finished product, and with Vorse Construction. We won’t hesitate to hire Vorse Construction again for our next building project.